Independent memory with accumulation capability. Great for almost any type of business or financial calculations. From the very first tap on the soft-touch keys, you instantly feel the ergonomic design that is built into the CP1213DIII. 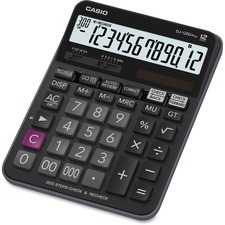 It's loaded with versatile features to perform almost any type of business or financial calculation, and additionally includes a large fluorescent display, two-color ribbon printing, and average and pairing calculations to help avoid any hassles, mistakes and/or wasting time. Power Source(s): AC; Display Notation: Numeric; Number of Display Digits: 12; Memory: 4-Key.